The music you are listening to was written and sequenced by Larry Holden. It has never been copyrighted and never will be. It is used with his permission. home of the University of Montana. 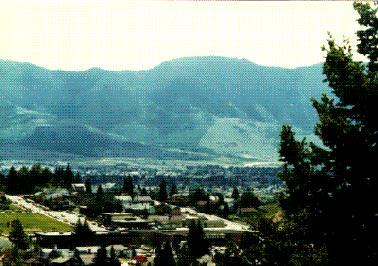 Missoula is surrounded by National Forests and a handful of wilderness areas. Looks like a pretty nice place to live. 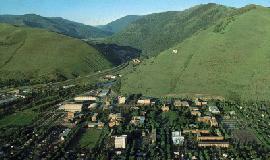 The University of Montana, chartered in 1893, is the state's leading Liberal Arts institution. It provides a well-rounded education of the highest quality to students and a wide range of services and resources for Montanans. You are looking at what is called "uptown" Butte. The large "M" at the top of the hill was constructed by students from Montana Tech. 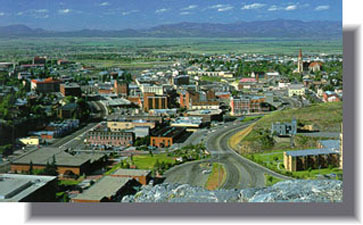 From the "M", you can see all of Butte. This is the East Ridge and Butte to the southeast of the Montana Tech campus. Here we are at the World Museum of Mining. A non-profit organization arose to preserve the rich, historical legacy and related culture of Butte and the surrounding regions. 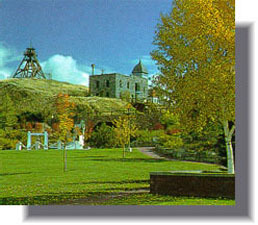 It also promotes the significance of mining heritage, educating folks who visit here on mining. Let's head north to the capital city of Montana and see what's there. This is a view of the city above downtown looking across the valley to the north. And a view of the city from the Civic Center looking toward the South Hill. Let's just take a leisurely driving tour around Helena. 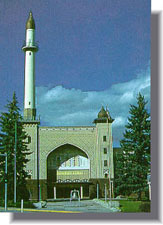 The Civic Center was originally built as the Shrine Temple. 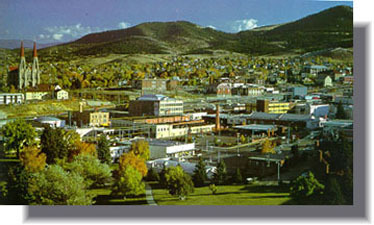 Now many of Helena's local cultural events are held here. 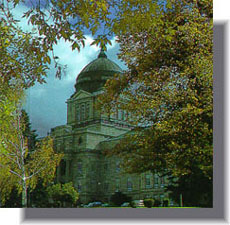 This is Montana's State Capitol Building. Within its copper dome and sandstone, marble and granite construction is housed many State offices. Original furnishings and artwork can be seen throughout the building. Seen from all over the city is The Cathedral of St. Helena. 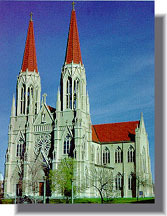 Modeled after the Votive Church in Vienna, Austria, and the Cologne Cathedral in Germany, the ornate architecture and lovely stained glass windows make the Cathedral one of Helena's most popular attractions. 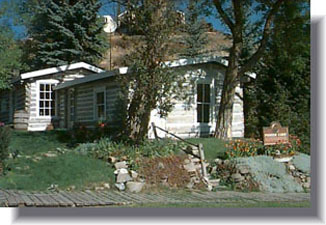 Built in 1864, the Pioneer Cabin is Helena's oldest standing residence. Inside you will find many period pieces of furniture and household items. This is the original Governor's House. Built in 1888, it served Montana's Governors from 1913 until 1959. 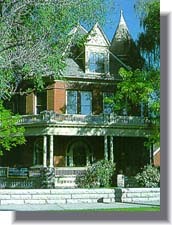 It is one of many mansions in Helena that reflect its gold rush history. 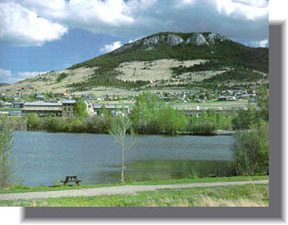 Anchor Park is used for many summer events including the Helena Jazz Festival, The Annual Governor's Cup and Shakespeare in the Park. Spring Meadow Lake State Park offers great swimming, fishing and skating. 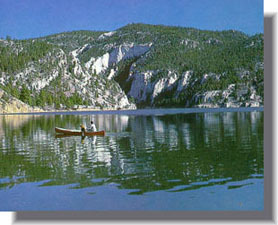 It is located on the western edge of Helena. Gates of the Mountains Recreational Area was named by the Lewis and Clark Expedition because of the visual effect while traveling on the Missouri River through the steep canyon walls. 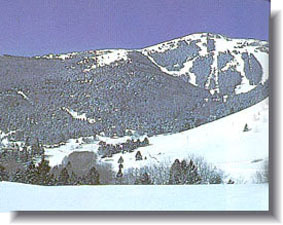 The Great Divide ski area is located about 40 minutes northwest of Helena. Isn't it beautiful? From the top of MacDonald Pass and the Continental Divide, you can view Helena Valley to the east. 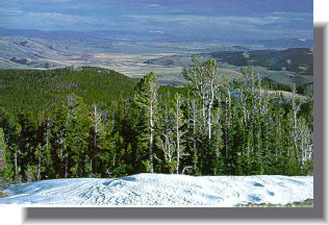 The Pass is located in Helena National Forest. Well, I think we've had a delightful visit to Helena. Don't you agree it deserves it's name of Queen City of the Rockies? It's time to move east. We're headed in the direction of Billings, Montana and it's quite a ride, so make yourselves comfortable. Click on the license plate and off we go!